20151007 - Up in the am and dropped D off at school on the way to work. I dropped him at the door today because he was almost late... that added 20 minutes to my commute... Finally to work and in the conference room most of the day, limited space, but got a lot done. Didn't leave until late. Got home and had a couple bowls of spaghetti with J watching TV. 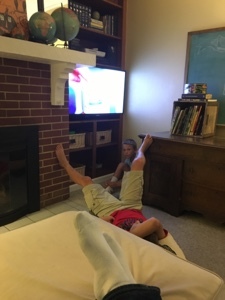 G was playing xbox, D was doing homework with his phone and computer watching baseball... L cleaning everything she could get her hands on and doing laundry... We watched the Carbonaro Effect for a while and then the little boys went to bed. Sittining on the couch getting caught up on the blog: September 2014 & October 2014.